Online trees may include attached records from Ancestry or that have been uploaded by the owner. Trees with source information are the most valuable because they make it easy to verify the information. The quality of online trees varies and each fact should be verified with other records before being incorporated into your research to ensure accuracy. Despite their flaws though, trees are a great source of clues and offer a wonderful way to connect and collaborate with other family historians. Online trees are a great way to organize your finds and connect with other family historians who share your ancestry and may have information to share. The trees in this collection have been contributed by Ancestry.com members. Using family structure can narrow your search for common names. Just add the names of other relatives in the fields provided. 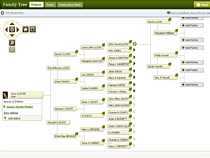 There are several collections of trees in this category including OneWorldTree, which "stitches" together probable name matches found in various trees to display consolidated results in a worldwide family tree. Because some of the connections in this tree were created electronically, extra care should be used with this resource, and as with any tree, information should be verified with original records before being incorporated into your research.